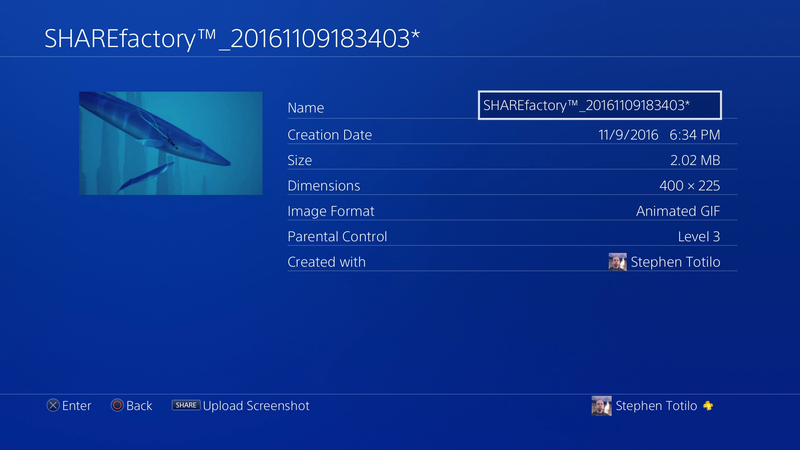 Sony has updated its ShareFactory PS4 application to allow users to turn gaming clips captured on the system into animated GIFs. The editing software is easy to use, though the GIFs are fairly low-res. They’re tailored for Tweeting. Here’s how it works. You can make GIFs from videos you’ve already captured on the system via the PS4's share button. You can also make them from videos edited already edited in the Share Factory app. In this example, I’m making a GIF from a capture I did of the game Abzu. There’s no obvious option to save the GIF. Instead, you can choose to “share” it. That’ll bring up an option to Tweet it, though you can choose not to and it will in fact be saved to your system. You’ll find your saved GIFs in your Capture Gallery app, though be aware that they’re not contained in the folder for the game featured in the GIF. 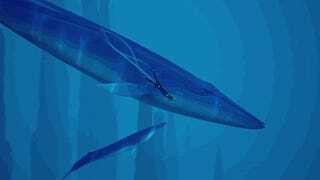 In this case, I was making a GIF from capture of the game Abzu. The GIF wasn’t in my Abzu folder. It was in the Share Factory folder. As you can see, the GIF is small, just 400 pixels wide and tailored to be Tweeted. This short one is just 2MB. If there are settings to make higher-res GIFs or ones that are longer than nine seconds, I haven’t found them. Maybe that’ll come later. This is a start.